If you've ever read any of J.D. Salinger's novels—and odds are, they were assigned school reading—you'll find Rebel in the Rye to be an interesting look at his life, and how he got to the point in his writing where he was able to write a novel. However, the film does move a bit slowly, which could cause some to lose interest. Jerome David Salinger (Nicholas Hoult) is a bit of a screw-up. His father, Sol (Victor Garber) wants him to go into the family meat-selling business, but his mother has faith that he can cut it as a writer. He's been kicked out of schools like NYU for his sarcastic behavior, but he decides to enroll in Columbia as a creative writing major, where his very first professor, Whit Burnett (Kevin Spacey), decides to challenge him to be the best writer possible. The war interrupts his plans, though, and after he gets back from his tour of duty, he's a changed man, which later affects his writing. Though Salinger mostly has written short stories, Burnett wants him to write a novel, and it's from this encouragement that The Catcher in the Rye is born. I've read Catcher as well as Franny and Zooey and a few of his short stories, but I didn't know much about Salinger before this movie. His life was complicated: after years of success, he ended up going into seclusion and not publishing anything else after that, though he was still a prolific writer. If you check out his Wiki page, he had many romantic relationships in his life, too, though only a few are covered here, and he fought to protect the integrity of his novels even through 2009 (he passed away in 2010). Yes, see this movie, just be aware that the pace isn't the fastest. Hoult does a great job as Salinger, but it's actually Spacey who steals the show here, as Salinger's professor, with whom he eventually has a fight that lasts many years. Zoey Deutch has a small role here too, as one of Salinger's girlfriends, and Sarah Paulson as Salinger's agent. For the most part, though, this is Hoult's show, and he pulls it off well. 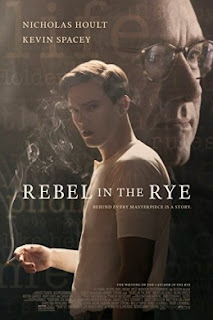 Rebel in the Rye is currently playing in theaters, and is rated PG-13 with a runtime of 106 minutes. 3.5 stars out of 5.